Ward Piano Company was established in 1944 by our Grandfather, L.J. Ward. Our Dad, Guy, joined the company in 1946 after completing his time in the service during WWII. They started out by taking one piano and fixing it up and then selling it. Their dedication to the quality of their work and their love of music led them to expand the company. As the demand for Ward's restored pianos grew, so did the business. At one time we employed about thirty-five men working two shifts rebuilding from thirty to fifty pianos a week making us the largest piano rebuilders in the Southeast for many years. These pianos were then sold to dealers all over the United States and as far away as Canada. As the demand for pianos has declined over the years we have concentrated our efforts more on our local customers needs. We have many types and brand names of pianos for sale including Grands, Spinets, Consoles and Uprights. Not only do we sell used and rebuilt pianos, we will also rebuild a piano you currently own. 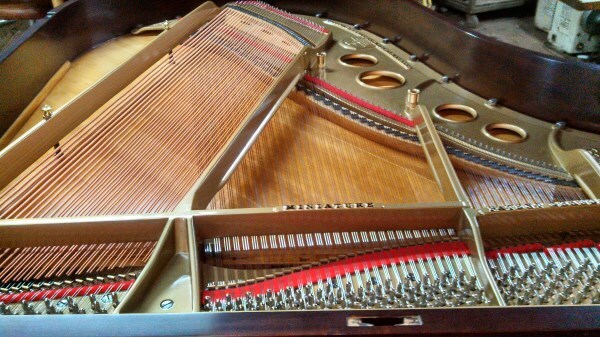 We specialize in all types of finishes, tuning and repairs, and also piano moving. My sister Kelly and I have been working in the family business since we were teenagers and have been running the company for over thirty years. We strive to bring you the best quality for the best price. If we can be of any service to you, our contact information is on the Contact Us page of this website or feel free to drop by anytime during our business hours. Thank You for visiting our website.